Since you are reading this you have probably guessed there will be no photo blog or post describing the Tampa Bay Rays first day of pitcher and catchers’ workouts. That means either I am trapped in the belly of a large whale, I forgot my camera card reader, or I decided to commit an completely spontaneous and insane act of eating way too many hot chicken wings and I decided to stay down in Port Charlotte for another great day of Rays baseball. I decided to instead “pop up” a “rain delay” bit of Rays Renegade programming by letting you gaze at a few of the comments presented to Rays Manager Joe Maddon at his first Spring Press Conference yesterday (Tuesday). So as I try and figure out why my ears are burning while eating these succulent wings, let’s switch our programming so you can enjoy the smooth and well eloquent styling of the Rays Johnny Cash loving Manager. I hope you enjoy it. What do the Rays need to do during (Spring) camp, and can they still compete in the American League East? It’s obvious the biggest loss probably is the Bullpen. That kind of exodus is difficult. A lot of our young players got a lot of experience last season. Whether it is Reid (Brignac) or Sean (Rodriguez), Matt Joyce, John Jaso, etc. All of these guys got a lot of experience, and experience playing in the playoffs. So I’d like to believe that’s going to benefit them. The starting rotation, you’re returning some really good stars…There are so many good things already in place. That’s where the optimism lies. If there’s one place that you have to have somewhat of a concern, that’s to reestablish and rebuild the best Bullpen in the league. But last year at this time when the Bullpen broke, there was no way you could have told us that it was going to be the best Bullpen in the American League last year. Andrew (Friedman) has complied some really good arms that we-re going to look at right now and during the course of this camp, try to set them up properly going into the season and see what happens. So I see our biggest obstacle to overcome regarding repeating would be getting this Bullpen back in order quickly. What timeline do you think it will take to solidify your Bullpen? You’re going to have your seven guys at the end of this Spring Training, and that’s wonderful…We know we’re going to be sending guys back (to the minors) that we feel as though they can help us here sooner rather than later. But the Bullpen that breaks here is going to earn that opportunity by what they do here. However, we are going to keep an open mind about those going back and keeping a close eye on the whole thing. It’s a bit of a fluid situation right now. Is there a process of determining who the closer will be, and the candidates involved? It’s always nice when you have that one guy that pitched the ninth inning and you know he is going to pitch the ninth inning. It makes it so much easier to dole out the other innings. So going into this camp right now, I do not know who that’s going to be. If someone shows that they want that particular job and they are able to do it, I’d be the happiest guy in the World to be able to say ” so and so” is going to be our closer because it makes game planning somewhat easier. Now having said that, I’m going into the season pretty much expecting to go committee-wise. We have a lot of upside names showing up. Guys we have never seen before that when you look at them on paper, they’re kind of interesting. I’m not a big Spring Training-evaluating kind of guy. However, this is going to be a different Spring for us and we have to be able to be more open-minded. Do you see also a rebuilding of the Rays team’s chemistry this Spring? Having a couple of veterans like Johnny (Damon), Manny (Ramirez), Kyle (Farnsworth) and Joel Peralta coming in is great. Of course we have some young guys within the group that definitely know the “Rays Way” of doing things- I’m talking about David (Price), Evan (Longoria) and B J (Upton). These guys know what is expected of them here. I want to believe that there’s going to be a nice blend where there are certain guys who are going to be apt and take more of a responsibility. Chemistry, I’m big on…We’re not going to go out there and spend an exorbitant amount of money on one or two Free Agents. We get really good athletic young players primarily and mix them with some nice veterans. We have to play our style of baseball, we have to all buy into it, we have to believe in it. I really feel the core group gets it, and I’m really relying on them to spread the word to the newcomers. This is what I always wanted to see happen since the day I arrived, and I think we’re at that point now where when you walk into our clubhouse from another situation, you realize quickly that this is how we do things here. I’m really comfortable with the ideas of the young bucks right now. I think that they’re going to be able to handle that load and pass the word. Regarding our play for this year, we have to do it in “another way”. We have to get back to the playoffs and its probably going to require another way. The Rays way is another way. When you just look at how we’ve gotten to this particular point over the last couple of years, the creativity with the trading and signing of Free Agents that we’re able to do, the draft things the development, all of that stuff. The ballpark we play in is kind of different… it’s a little bit funky. And in spite of going to the World Series, it’s still difficult to attract. So there’s all of these little flaws about us, and in spite of it, we’ve still been able to overcome these things to the point that we’ve become rather successful. So this season, why not choose another way to get back to the playoffs. That speaks to all the little quirkiness about us. I think I wanted our players to understand we’re going to have to do this in another way. The “Rays Way” and “Another Way” are synonymous terms and that kind of smacked me right in the face this past off season. Going into this year, we’re going to have to figure out another way to win, and we’re going to do that. We relish the challenge. In our opinion, there’s no more challenging division in all of professional sports than the American League East. Fortunately, we have had some success in the past few years that confirms a bit of the way we go about our business. But it’s really a survival mechanism. For us, we have to operate the way we do to have a chance to compete in this division Again, it gets back to knowing who you are. We appreciate who we are, where we are in the landscape of this division in that we have to get creative and problem solve in different ways. I wouldn’t say it’s necessarily changed what we knew in 2006 that this was an incredibly difficult division. If anything, it’s probably gotten more difficult in that the other four teams are extremely well run, which makes it even more challenging. But it also makes it much more rewarding. The success we had in 2008 and 2010 was incredibly meaningful to all of us. It’s an extremely difficult thing to do and it’s something that inspires all of us. I promise to be back in St. Petersburg on Thursday and will post both a photo blog and a review of some of the day’s activities including my first encounter with ManRam. Was a great day, but I got to go…These wings now have my feet sweating, and I am in an sir conditioned room with flip flops on….arrrg! Pint of milk….stat!!!. Those 5 numerals just seem so daunting and huge finally up there in print for me to gaze upon. Never in my wildest daydreams or nightmares did I ever think I would be celebrating a number like this online, much less writing about the sport that takes my breath away even today. So I hope you do not mind today, but I am going to get caught up in the flow and totally just bask in a unfathomed achievement to me. Here I am posting my 1,000th baseball blog post today here upon MLBlogs.com. I know it is a bit anti-climatic, but it really does seem like yesterday that I popped up my first post. I was a bit apprehensive back on September 7, 2007 when I decided to submit my first blog. I had been out of the journalism game since my early twenties, but I missed it every day. I started this blog as a daily distraction while trying to find a second career after leaving the ” job of my lifetime”. I prodded and poked and edited that first post like a painter meticulously fiddles with his artwork. It was not a great piece, but it was mine…all mine. My then fiancée had read some of my short story material I had posted to an old Myspace account and had somehow convinced me to again plant the sportswriter seed that had flourished when I was a Sports Correspondent for a local newspaper. I knew that day when I had to walk away from that green IBM display screen and leave my expanding sports clip file behind it was a huge career mistake. Now was my chance to see if the talent was real. If I could find the passion again to resurrect the glimmer of that career I left slip away so long ago. Baseball had always consumed my life from mid-February to late October, but the floodgates were thrown wide open as my mind expanded around the concept of the entire spectrum of MLB, not just my hometown Tampa Bay Rays. Along this journey I have often revised, re-set or even tried to re-energized my blog from its first reincarnation to a more fan-based perspective with a slice or two of inside information and photos that you will see nowhere else. With it I also rediscovered a lost passion for photography. All you have to do is click on my dirt post, “D No Longer Stands For Devil Rays” to see that my first MLBlogs.com post corresponds pretty close chronologically with the time period that the Rays changed their MLB identity with an explosion of new uniforms, team colors and a complete logo redesign. 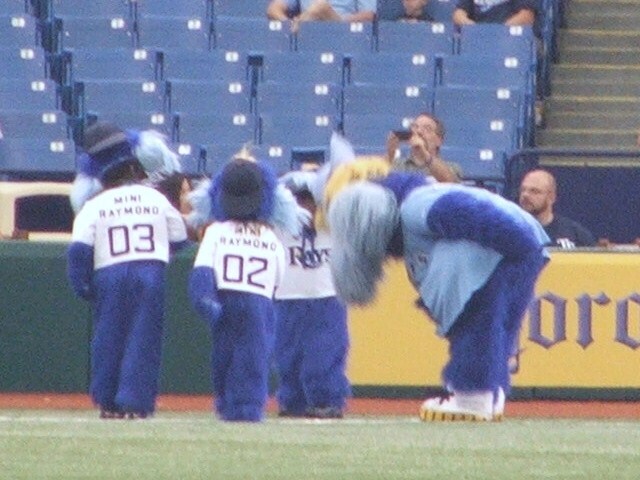 It was a total coincidence that both the Rays and myself were re-defining our mojo at the same time. Since that first day back in 2007, I have seen almost a half a million web page hits,( currently at 488,250 ) plus over 6,152 comments. The consistent feedback and comments made by the MLBlogs.com community, and the Internet have inspired changes and a wider spectrum of subject matter over the years. Who remembers the 3-post blog expose` on Maple Bats? My 1,000th blog post is not the only thing I am celebrating today. recently I received an e-mail from Mark Newman, who is our “professor” here at MLBlogs.com informing me that I hit the top spot of the blogging site’s Fan segment. I am thrilled to reach the top spot, and I know so many of you will also have the experience of claiming this same spot at some point in your blog’s existence. So on this day of (now) multiple celebrations, I have decided to give back to some within MLBlogs.com. I am going to throw a few pearls of wisdom I collected over the past few years that I hope will help more of our aspiring writers to achieve greater results, and increased page views. I hope MLB doesn’t put out a “hit” on me for giving up some secrets. More than a few people have asked me how I achieve my high rankings every month, or if there is a trick to it all. The honest answer is: I am just another in a long line of writers on MLBlogs.com. There are so many different points-of-view, a varied wide range of opinions and even blog styles on MLBlogs.com. But that is also one of the keys to getting noticed in a sea of blogs. I think the first suggestion is to be creative in your writing and your overall thinking as you comment and explore the MLBlogosphere. With that in mind, your name is the first indication to people of who you are. I decided on Rays Renegade because I have always been the guy in life who bucks some of the antiquated traditions and questions things. One of the most important things to do is to get yourself known by your MLB blog name by your peers both on MLBlogs and beyond. The “Recent Activity” box on the MLBlogs.com homepage is a great tool that can be an instrumental ally in getting your blog both noticed and for you to interact with other writers. The “Recent Activity” box actually serves a duo purpose for me. First, I get chance to see who is writing or commenting, plus I can get a chance to read their latest post just by clicking on their name. The simple action of networking, getting to know your fellow MLBloggers on a consistent level should help create a bond that will have them hopefully following your writing. This familiarity or bond should breeds an increase in your exposure on MLBlogs.com, which in turn should dramatically increases your page views. I made a resolution in late January to visit each and every blog listed in the Top 50 Fan blogs in the “Latest Leader List” during that calendar month. I am currently past the number 35 spot and working my way down to number 50. I do not have to do this, but it is a personal commitment I made to get to know some of the budding writers on this site. I actually seek out those new blogs and try and see the new talent that is on the horizon and show them people read their posts. I enjoy reading the new blogs and posting a comment. No matter who you are, there is an internal ego that wants people to give you feedback on your writing. By getting yourself out there exploring other blogs, you get new post ideas, refresh your own streams of imagination plus provide feedback to your peers who want to produce a well received blog post. There have been more than a few young blogger’s who because of school or other activities felt they were neglected their writing duties and wanted to cease posting. This is a site for all of us to express, project and explore the great far reaching corners of fandom that surround the great game of baseball. If you are writing to gain some acceptance, or win some monthly popularity contest, you better transfer your work elsewhere. Writing should be about the passion. That passion doesn’t stamp a time clock or has a definite schedule. Life happens, and if you are young, that outside MLBlogs life take priority. Write when the spirit moves you. Write when you have a great event to tell us. Write because you want to, not because you have posted only once this week. I write for the pure joy of writing. If that passion ever falters, I may fade to black and write a “-30-” on my last post. Journalism students know that simple writing symbol represents “the end” to your story. Another thing I find tremendously helpful is staying positive. I am a glass half full kind of guy. Sure I have written a few negative or even disparaging posts in my time, but I keep my head in the positive cloud. I leave the insults and injury mentality to others. If I wanted negativity, I would write a police blotter. Everyone can write. It just takes a passion. a commitment and even a little luck to stay with it long enough for people to look forward or seek out your posts. Do your writing at your own pace. You do not have to write every day like I do during the season, or 3-4 times a week in the off season. Stay within your guidelines of time management that enables you to write something consistent and great. Your writing should flow out of you like a fine Dr Pepper into a glass of ice. Most of all, have fun. 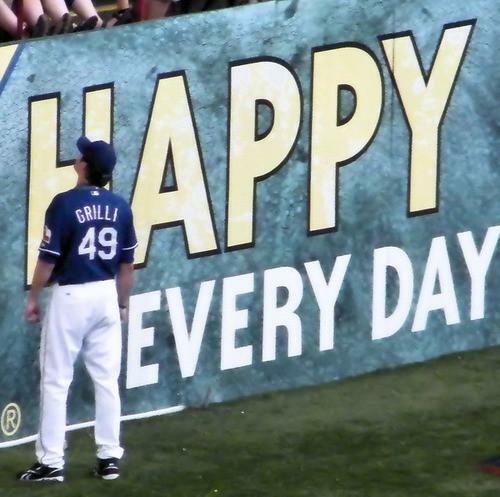 We all have the joy of baseball within us or we would not be writing here. Keep that joy close and within your grasp and everything you write will shine from a focused light. I am so proud to write on this site. I have turned down offers of writing elsewhere and even dissolved my own website to write exclusively here. I could entertain and possibly get some financial rewards from other websites, but I enjoy the MLBlogs.com community and want to see it grow even larger in the near future. The MLBlogs.com site has let me rediscover a love I pushed away years ago. It has granted me the chance to again write about something I am soooo passionate about. But most of all, it has let me get to know each and every one of you in some way through your comments or posts. I can not put a price tag on that….ever. More and more I am being assured that we, as Tampa Bay Rays fans have been spoiled by this organization. 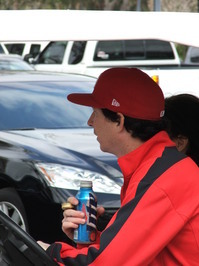 Here we are just a few days before the 2011 Rays Fan Fest and decided to look at the recent St. Louis Cardinals Winter Wind-Up event. Suddenly I see just how different and special the “Rays Way” of producing their Fan Fest far exceeds the norm in the MLB. Then there are the events held by teams like the White Sox or Brewers over multiple days that have their fan experience in convention centers with isolated rooms where if you have a purchase a pre-paid ticket or lucky pass to get a players signature and purchase an additional ticket for a possible photo opportunity with one of your favorite players. 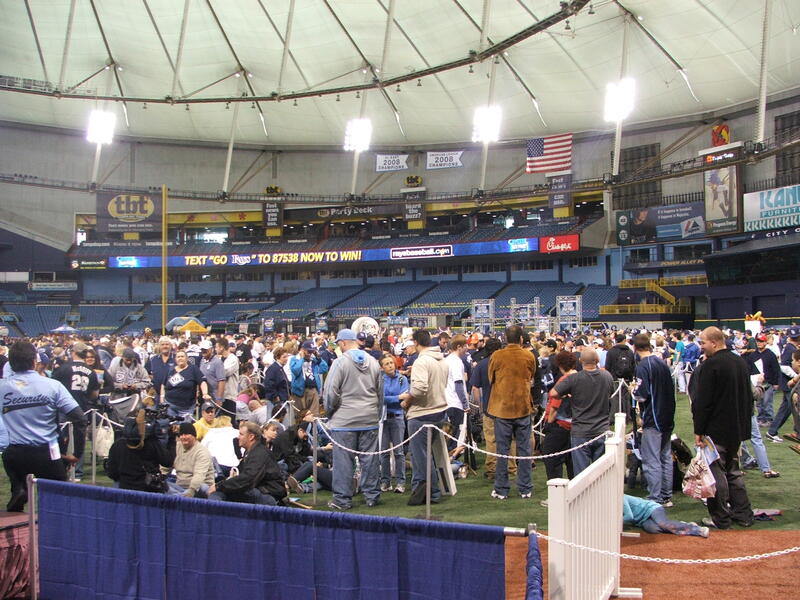 Just reading about idea of pre-paid tickets purchased in advance, with certain designated autograph times in isolated rooms, segmented away from the public just makes the whole Rays Fan Fest format extremely fan-friendly. We have surely been spoiled in the past years with FREE admission and FREE autographs, plus other opportunities for players to interact with fans at numerous other events during the day. Maybe that all is about to morph into a new animal or idea in the future. The Cardinals are not the only MLB team to put on a multiple day Fan experience, but from that point things go a bit…well off the charts. Their 2011 fan event was held from January 15-17th at the Hyatt Regency St. Louis at the Arch. The pre-event details and autograph pricing list definitely had me twitching at the keyboard wanting to state my opinion. The idea of paying $ 40 for the Rays autograph wristband is no biggie to me, but the pricing list for autographs at the Cardinals event left me a bit….hoping the Rays did not venture into these waters….yet. I am definitely starting to feel that maybe we all have been extremely spoiled by the Rays generosity in the past by not pushing their autograph session to this kind of level, and keeping the players basically in front of the fans. You get a special rush in you as you snake through the autograph line to finally get to walk towards the podium and get a signature and possibly chat for a moment with the player before embarking on maybe standing in another line for another signature before an hour time elapses and the next band of signers’ take their spots. I still remember when the Rays Fan Fest was a 2-day event, and maybe the Rays have been giving all of us so much for literally nothing all these years that I forgot the true fan advantage that we, as Rays fans have over some other teams. We have some of the most accessible and personable players in the MLB, and that is a great gift. But maybe the era of something for nothing is about to close. It is part of the evolution, the process, the way thing eventually go or flow. Change happens. Just like the Rays, the Cardinals asked their fans to purchase via a charitable donation, a limited amount of pre-priced autograph tickets prior to their event. The Cards gave you the option of buying your player’s autograph ticket online, or possibly with fingers, eyes and knees crossed, there would be a smattering of leftover tickets available the day of the event. As you can guess, that second option was as viable an option as the proverbial needle in the haystack. 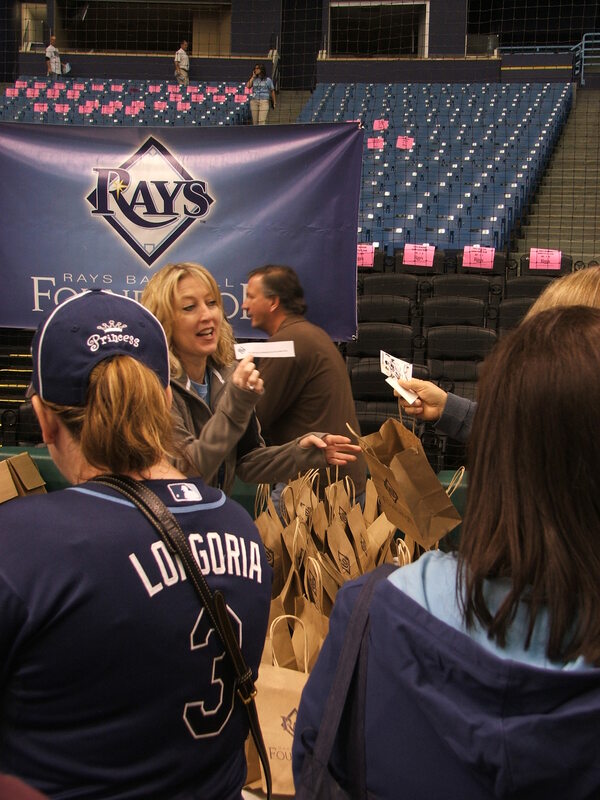 From there the Cardinal autograph sessions further separated themselves from the Rays format of a one-time $ 40 donation for a Rays Fan Fest wristband (if you are over 14). At the Cardinals Winter Warm-Up event there was a rolling list of prices that ranged from 54 players from the Cardinals past and present signing for FREE including ex-Rays broadcaster Joe Magrane and local resident Danny Cox. From there the Cardinals scale quickly went from $ 5 for an autograph from relievers Jason Motte, Trever Miller or Kyle McClellan all the way up to $ 100 for Matt Holiday, or $ 175 for Albert Pujols. A interesting side note, Pujols signature actually has stayed sort of “recession proof” at the same autograph pricing for the past three Winter Warm-Up events. Not sure of what price I would estimate or guess an Evan Longoria, Johnny Damon, David Price or Manny Ramirez would bring, but it would not be set in stone at $40 total price for all 4 signatures. Cardinal Baseball Hall of Fame members Bob Gibson ($ 125), Bruce Sutter ($100) and Lou Brock ($100) also had autograph tickets available in the 3-digit range. You could also purchase tickets for autographs from former Cardinal greats Ray Lankford ($10), Vince Coleman ($10) Jack Clark ($5) if your autograph needs were dictated by a shoe string budget. By comparison, the Rays will have 30 MLB Alumni members including Mark Whiten, Von Hayes and former Rays closer and All-Star Roberto Hernandez signing for FREE during Fan Fest. Before all of you Rays supporters get all upset and rant and rave about this pricing structure, remember it is all going to Cardinal Care, the St. Louis charity that mirrors perfectly with the Rays Baseball Foundation. Cardinal Care is the primary charitable arm of the Cardinals organization that provides financial help in the surrounding communities. This Winter Warm-Up event is one of their biggest donation events of the year. But if the sticker shock of seeing $ 175 get to you, there are a few other possible options if you happened to sleep in and missed the Pujol’s online ticket auction. You could be one of the top bidders in an exclusive 10 bid online auction that will position you as one of the first 10 spots in line for Pujol’s autograph, plus you will received 2 Winter Warm-Up passes, and the added bonus of two future tickets to the all-inclusive Champions Club for a game during the Cardinals 2011 season. If that is still way out of your economical range, you could purchase a $ 1 scratch-off ticket that will get you an instant opportunity for a Pujols autograph. Oh, and Pujol’s will only be signing baseball and bats. No jerseys, photos or posters at this event. $ 40 is starting to look real cheap right now to those people over 14. For some reason I am starting to get the sneaking feeling that the Rays exclusive $ 40 offer, or that the present format of tables set on a podium in plain sight of the public right on the NEW AstroTurf of Tropicana Field might go the way of the dinosaur at some future point. 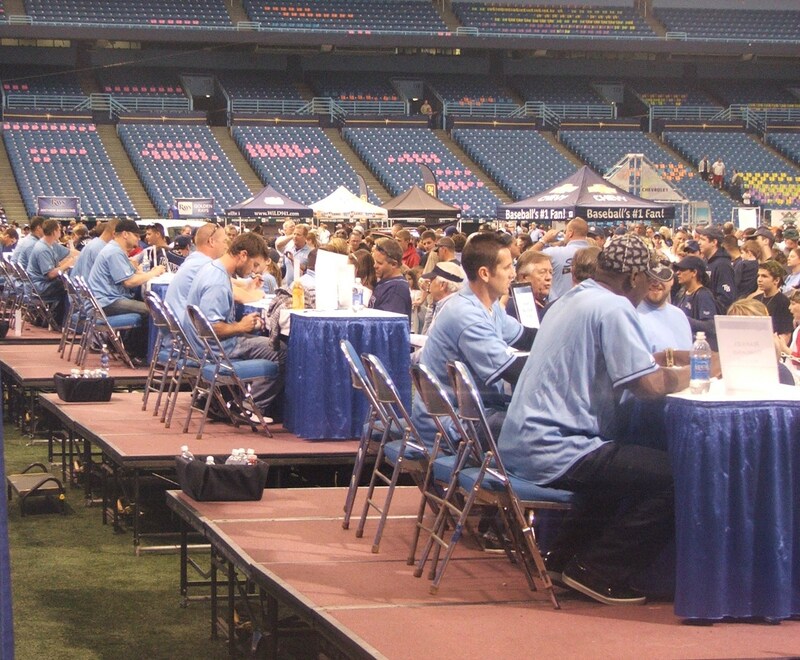 The Rays Fan Fest has always been a free day of family and baseball related fun and frolic from the player’s autographs, to kid’s hitting wiffle balls, to the Metro PCS Call-A-Friend promo, to the roundtable discussions with some of those in the MLB trenches. Sure the Cardinals have a larger two hour total window for player signings, but if you miss your “window of opportunity”, you are left totally holding the ball (literally). You also might not get that air of personal interaction with the player that has been one of the things I have come to love about Fan Fest. 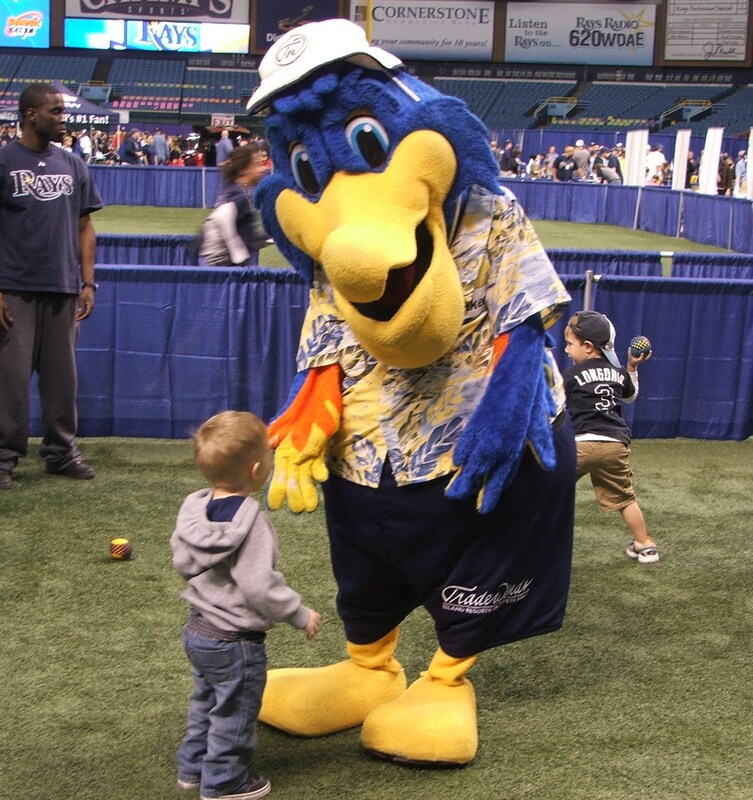 Plus there is a extremely affordable advantage that Rays Fan fest as always, has FREE admission. If you wanted to attend the 3-day Cardinals event, you had to purchase a $40 Entry Pass and have it displayed you at all times. At Fan Fest, you just park your car, walk into the Rotunda towards the field and enjoy the festivities. More and more that $ 40 for fans over 14 for a Rays autograph wristband feels like a sure fire MLB bargain. But if you are a kid under 14, the autograph event is still totally free, which feels amazing especially after you get that much wanted David Price and Evan Longoria autograph…without a single ticket. 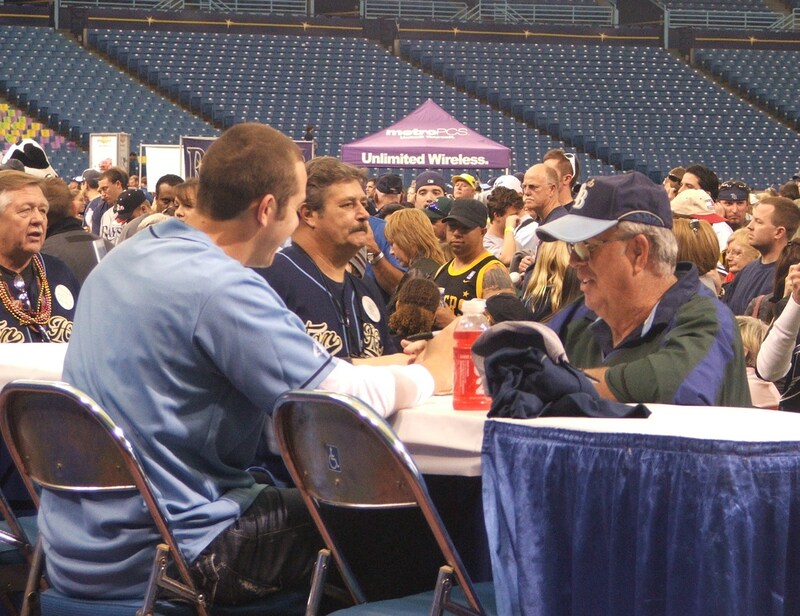 During the Tampa Bay Rays 2011 Fan Fest, there will again ask for a donation fee for those over 14 years of age or who are not Rays Season Ticket holders who want to seek an autograph of their favorite Rays player. This year that honor will cost you $ 40. Immediately I am expecting to hear those adult voices rise up into a higher octave and even denounce or boycott the autograph lines. I, for one will pay the $ 40 with a smile on my face for the entire amount will go the Rays Baseball Foundation and also the foundation for two St. Petersburg Police officer’s families. It is also a chance for those “collectors” to make their own charitable donation to help support the many Rays Baseball Foundation charities that need yearly support. Still there will be those who want their voices heard loud and clear. 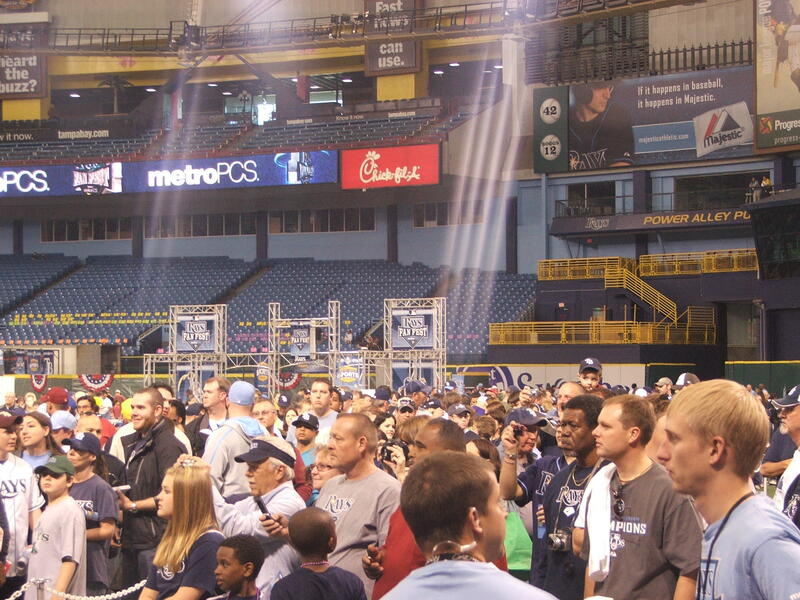 For them I want to remind them that the Rays Fan fest is a mostly FREE event. That it is not held in a convention center like the 2011 SoxFest or 2011 PiratesFest,. It will be featured upon the NEW Astroturf surface of Tropicana Field. But still there will be those distracters that want to showcase the bad president instead of the good this small amount of $ 40 will do for those in need within our Tampa Bay community. 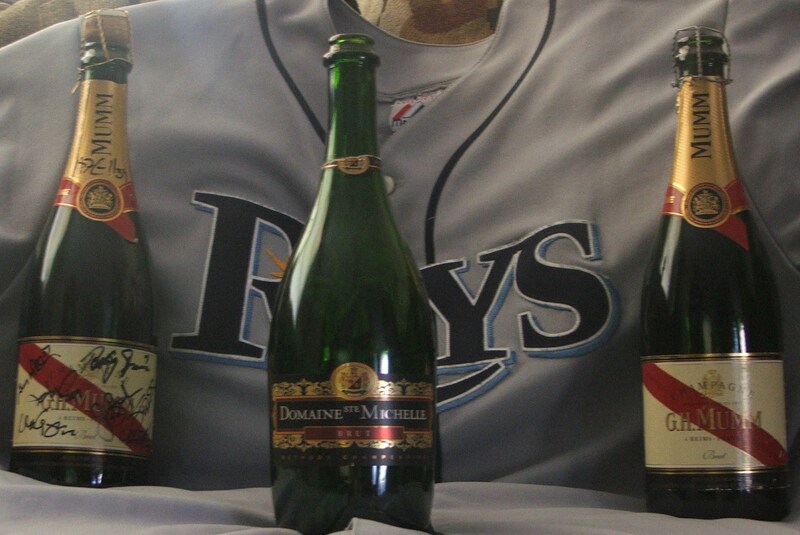 That is how spoiled we have become as Rays fans. No tickets are needed for entry like at the Milwaukee Brewers 3rd annual On-Deck experience ($15) or the recent Orioles Fest which cost $ 12 for adults and $ 4 for kids under 14 or adults over 55. Somehow we as member of the Rays Republic have forgotten what this event is really all about. It is a time to rejoice about the beginning of a new Rays season. 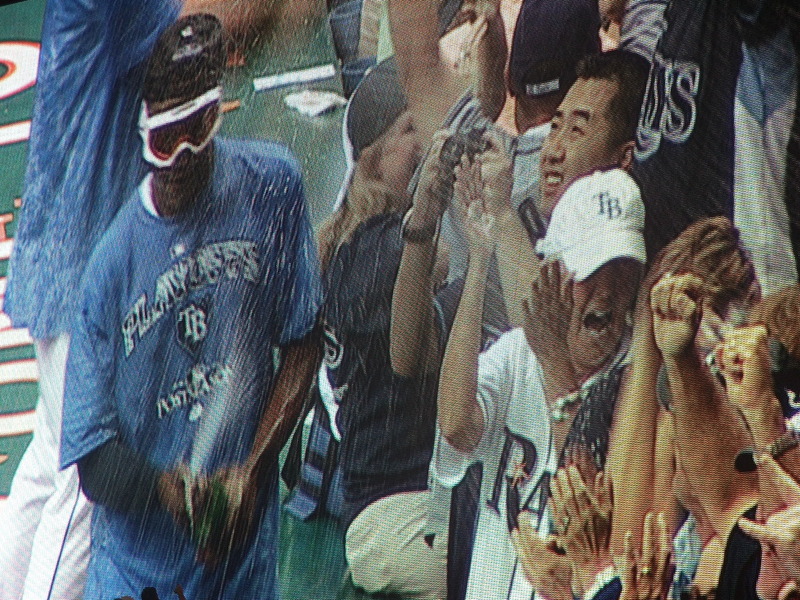 It is the time for utter excitement, plus the first day to purchase single game Rays tickets. It is about celebrating Spring with both the old and the new Rays players, and welcome them to our team with huge smiles. And all without a single dollar spent for admission fees. $ 40 is not much considering it covers every autograph session of the event, including all of the designated players in your line in your autograph line during that time period. Did you know at SoxFest, which is also a 3-day event, there are daily limits for individual autographs and photos with players? Would you want the Rays to institute a possible $ 15 voucher offer in 2012 for each selected player or alumni group during a time period with it possibly of it selling out even before you get on your computer, or arrive that day to Fan Fest? Would you be happier if the Rays decided o go the route of the Atlanta Braves and just have a yearly scheduled Rays caravan each Spring instead of a day celebrating Rays baseball with the whole community invited? The Braves 2011 caravan actually began on January 24,2011 in Macon, Georgia and will make several other stops before finally concluding on February 5,2011 in Madison/Nashville, Tennessee. During their caravan, the Braves will only have one chance for Braves fans to get the autograph of new member Dan Uggla, who ill only be appearing at the last event in Tennessee. At the Rays Fan Fest, all signed Rays players plus most of their minor league players will be at a Rays signing table at some point in the day. You cannot be guaranteed that at other team Fan Fest. Think about it, $ 40 could get you Evan Longoria, David Price, Rays Manager Joe Maddon, plus possibly get autographs from newly signed Rays players Manny Ramirez, Dirk Hayhurst and Johnny Damon. More than worth the one time expenditure. 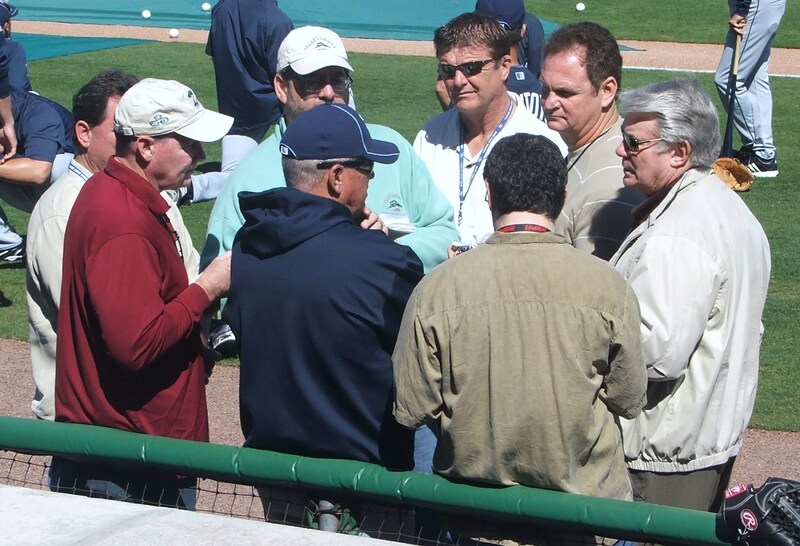 In recent years, the Rays have also heard you loud and clear on the congestion and turmoil that multiple players signing can provide with duo lines sometimes forming at the first table, or snaking lines going all the way out of the Rightfield tunnel into the concourse. 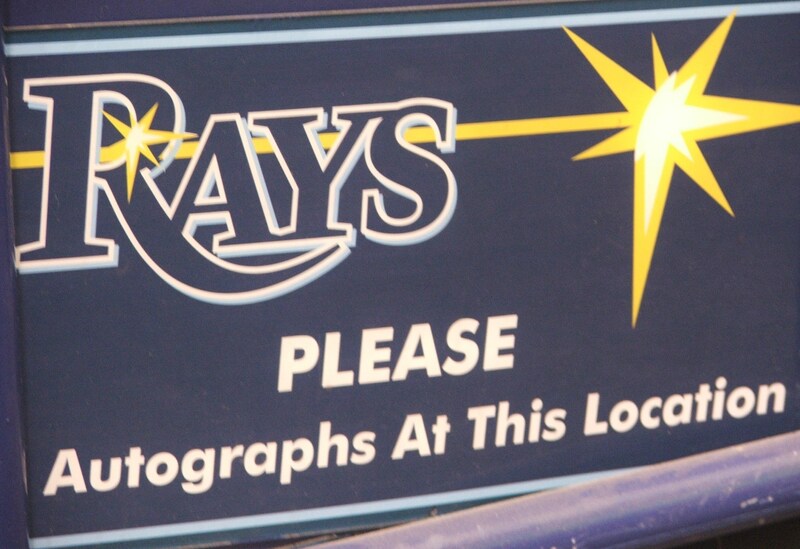 A staff member of the Rays wrote to me that the Rays are trying to eliminate those kinds of autograph headaches during Fan Fest, but a popular player will still garner a huge line and a possible result of no signature before the next group arrives for their singing times. That might mean moving a popular player towards the middle two sections of the autograph area, but that is still better than not getting a chance at all to get a autograph after the singing sessions are sold out in advance of Fan Fest or cost $15 for each scheduled autograph session like OriolesFest. 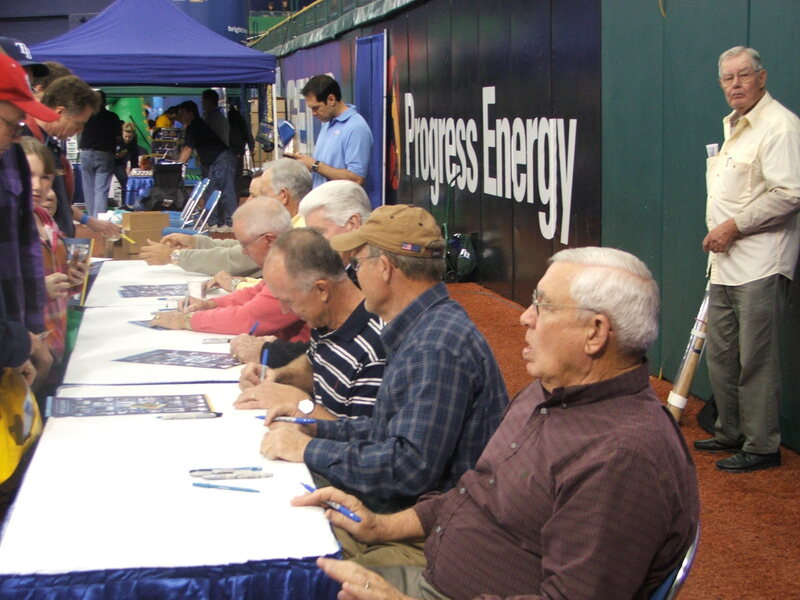 Do not forget again that the $ 40 fee for the Rays autograph sessions wristband (for those over 14) will benefit the Rays Baseball Foundation in their ongoing endeavors to help baseball flourish in this community. If you wanted to attend all 5 signature groupings during OriolesFest, it would cost you upwards to $ 75 dollars for the same amount of signatures. Plus if your Rays player signings at Table 2 get completed in time for you to possibly stand in Table 3’s autograph line during the designated time span, it will not cost you anything additional unlike the OriolesFest. At SoxFest, your voucher was only for that player during that time period, not for unlimited usage or wandering into additional lines for signatures. Or maybe you might want to force the Rays to reconsider their FREE admittance and possible charge $ 15 dollars like they did at the Brewers event at the Frontier Airlines Center. A $ 40 one day autograph wristband charge for signatures to me is a bargain any day. Considering the additional fees and signature admittance charges of other Major League Baseball fan events, it is a down right steal. Still, you child under 14 can still stroll up to their favorite player and get a signed autograph or smile at no charge…and how can you even put a price on something like that. I remember once as a kid some one telling me that things happen for a reason. That fate, destiny and even the kiss of the Gods can not foresee some things that bring people together. I think this was focused more on romance than one two people bonding under a common goal, But I’ll take it. So here on the last day of the “Charity week” I am going to tell you a story about how two different individuals got together and formed something that is changing lives. It is a reminder that two different worlds can combine and conquer anything in their path. 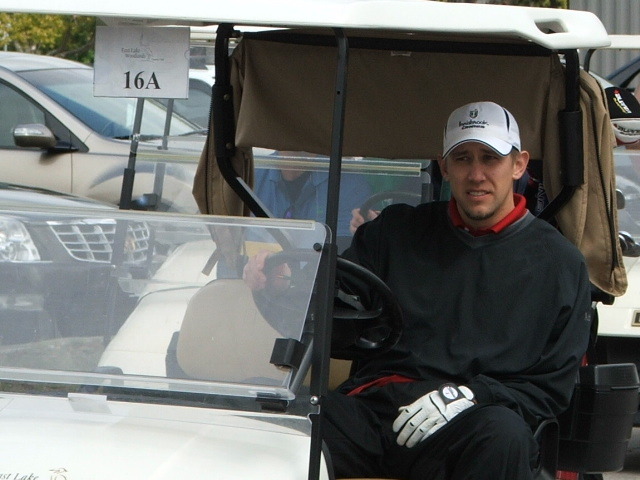 Jesse Litsch volunteered for a off season charity golf event back in November 2008. In his paring was a young financial wizard named Kevin Bechtel. 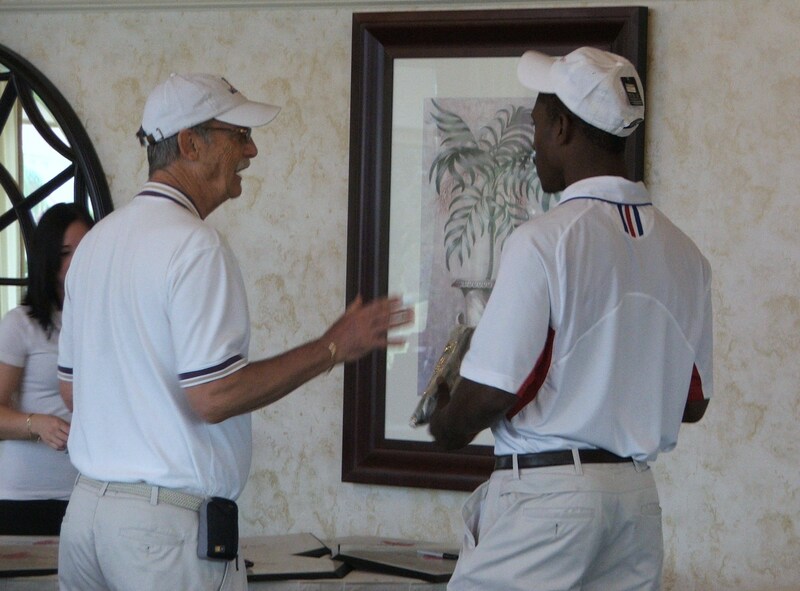 The golfing event was to help children in the northern reaches of Pinellas County. 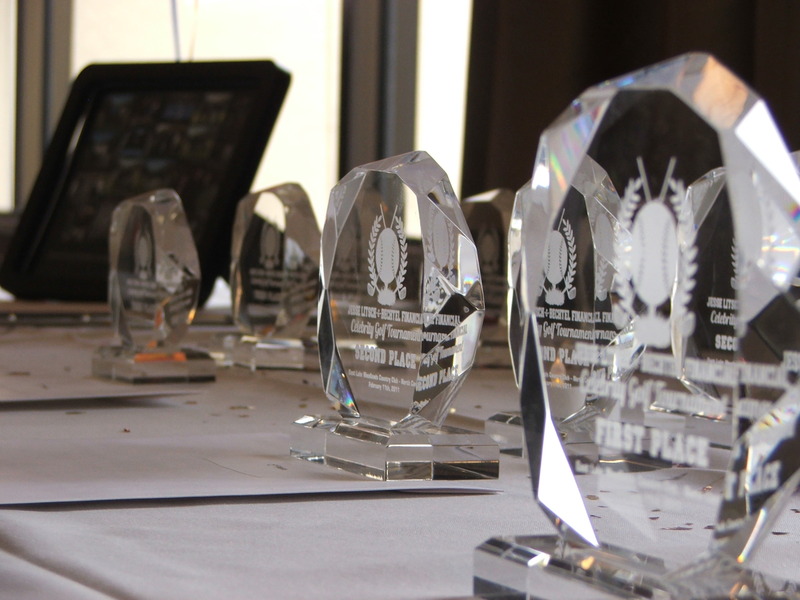 During the nightly awards ceremony, the two shared stories of other charity tournaments they had both attended and came upon the realization that if they combined their charitable efforts, both could reach a wide spectrum and fulfill their passion of giving back to children in need. 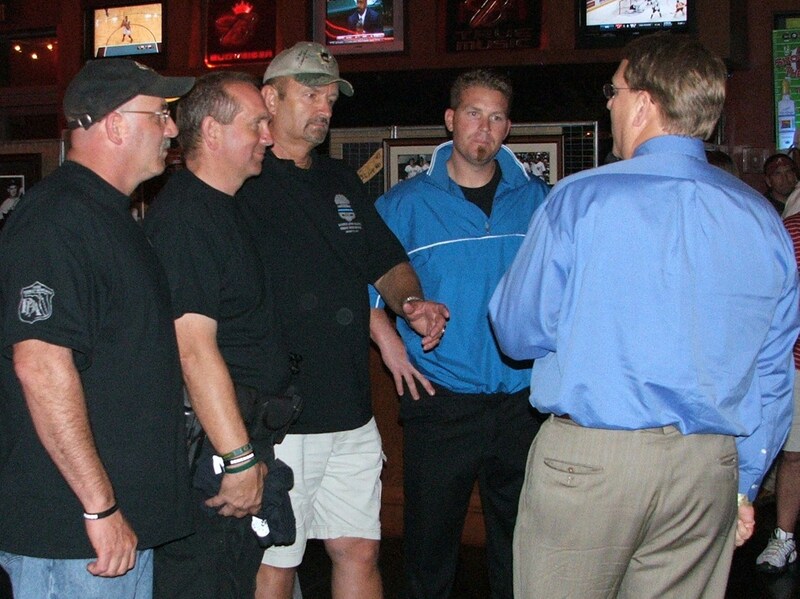 Each told swapped stories about how Litsch had done fundraising and benefits before for the Boys and Girls Clubs, and Betchel told Litsch about his “Bikes For Kids” charity that gave bikes to needy and under privileged kids through the Pinellas County Sherriff’s Department. When both attended the opening of the Police Athletic League (PAL) center in the Lealman region of St. Petersburg, the bond began to form a tournament to facilitate the needs of both charities. What might have cemented the bond was the way Litsch talked about how the PAL had helped mold him and performed a vital part of his life growing up in this region of Tampa Bay. Soon, Litsch attended the “Bikes for Kid” event that holiday season and Litsch witnessed firsthand the joy and passion of Bechtel’s own commitment to his program. That evening over 100 bikes and helmets were delivered by PCSD deputy’s. 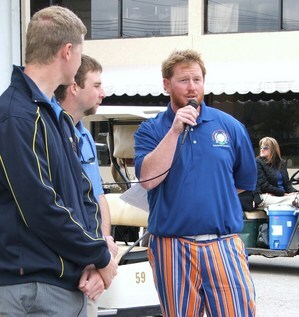 That day formed the basis of what became the Jesse Litsch & Bechtel Financial Celebrity Golf Tournament. The first joint effort between the two newly formed friends came in 2010 and expectations rose quickly as to the extend and paths the future could bring for both organizations, and for the tournament as a whole. I caught wind of the tournament right before the Toby Hall Celebrity Golf Classic and spoke with Jesse Litsch tournament organizer Sarah mire moment before I was heading out to help in that tournament. When I saw Litsch that day on the golf course I spoke to him about my volunteering and he gave me that huge smile I had known for so many years when he was a Rays batboy/Rays intern. I was anxious for Friday to arrive so I could have my first experience of this tournament. 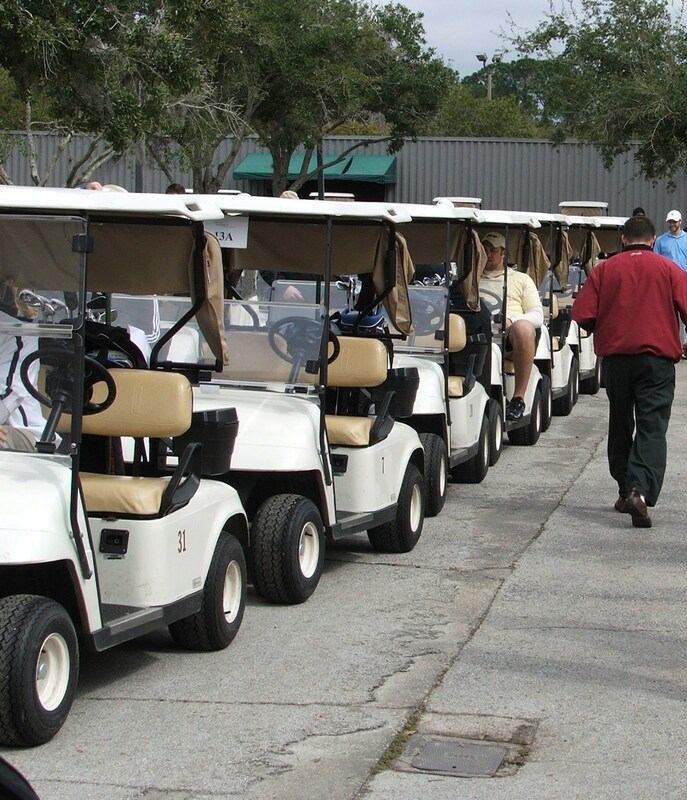 I got there just as Kevin from the Pinellas Park Boys & Girls club along with a few other volunteers were fitting each cart with some golf tees and some water for the days action. I then went up to the registration area and met Jesse’s fiancée and walked into an amazing silent auction site with just over 50 items up for bids. The items ranged from signed hockey sticks and framed signed photos to a pair of glistening exquisitely cut diamond earrings that held an appraisal price of $ 1,650. Massage and photo opportunity for yourself or family, plus if you bid for a razor scooter, the charity will but another scooter with your bid for another youngster in the Tampa Bay community. But the thing that had me salivating was the chance to purchase 1 of 10 bats that were signed by every celebrity in attendance. But there was some additional high brow auction’s out there that piqued my interest. A chance to join your favorite MLB player on the field for BP, plus two tickets to the game. A California Wine Country Tour complete with hotel accommodations, dinners and a plethora if wine tours and tasting’s. 2 tickets to Vinny Lecavalier’s suite for any Tampa Bay Lightning game. Two Park Hopper passes to any Walt Disney Park in the World. The event was a “who’s Who in the Blue Jays organization such as pitchers’ Brett Cecil, Casey Jansen, Shawn Camp, Travis Snider, Ricky Romero, David Purcey, Scott Richmond, Jesse Carlson and Josh Roenicke. But not being outdone was the display of hitting talent from the Jays Jose Bautista, J P Arencibia, Aaron Hill, Adam Lind and Travis Snider. The Tampa Bay Rays had a few member in house today representing the Rays present and past. Shortstop Reid Brignac and reliever Andy Sonnanstine, plus former Rays catcher Toby Hall were all out here for the kids today. Heck even World Class skateboarder Anthony Furlong was out there giving his all for the event. 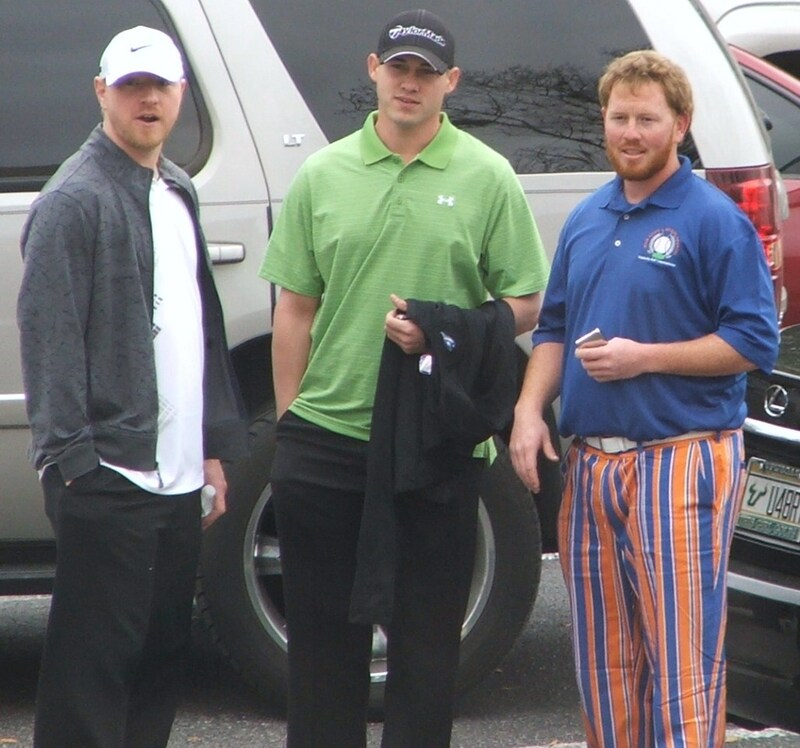 And the display of interesting golfing attire was out with a fury today as both Bechtel and Litsch had on by far the most eye irritating pants of the event. I am going to flash forward to the Awards dinner that was MC’ed by local television personality Charlie Belcher of Channel 13 fame. The show of support by Litsch’s Jays teammates combined with the other golfing competitors today made the night just seem to sing. 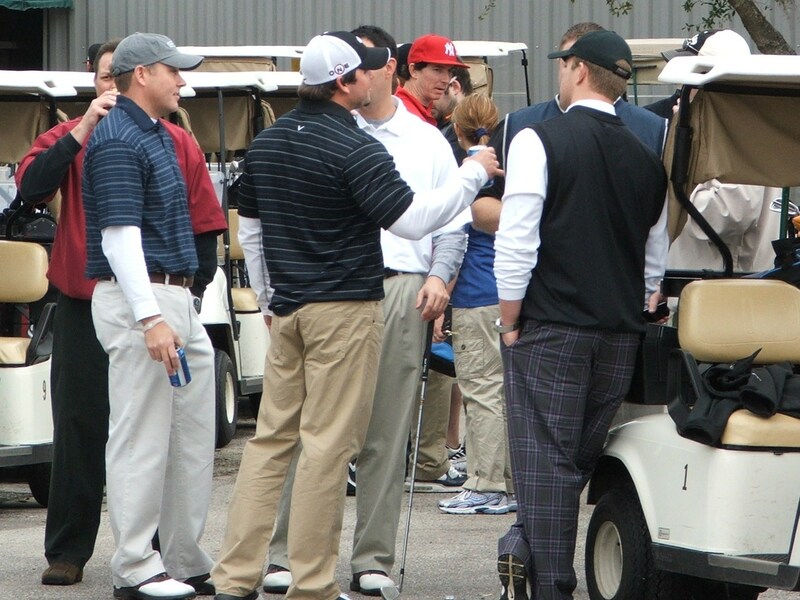 This really felt more like a team gathering than a golf event with great bellowing laughs and bold predictions as to the tournament’s winners. 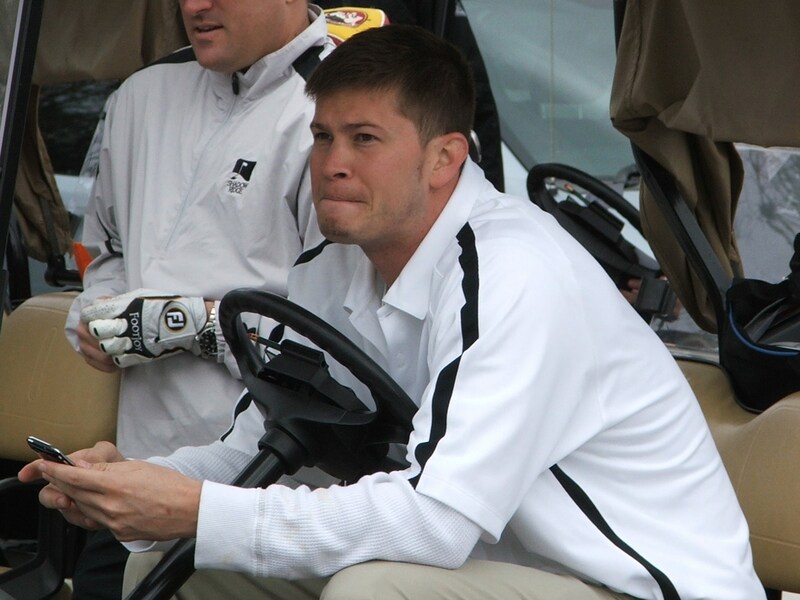 The team that actually pulled it out today was led by celebrity Toby Hall, who’s 5-some spotted a score of 55 over the 18 holes. 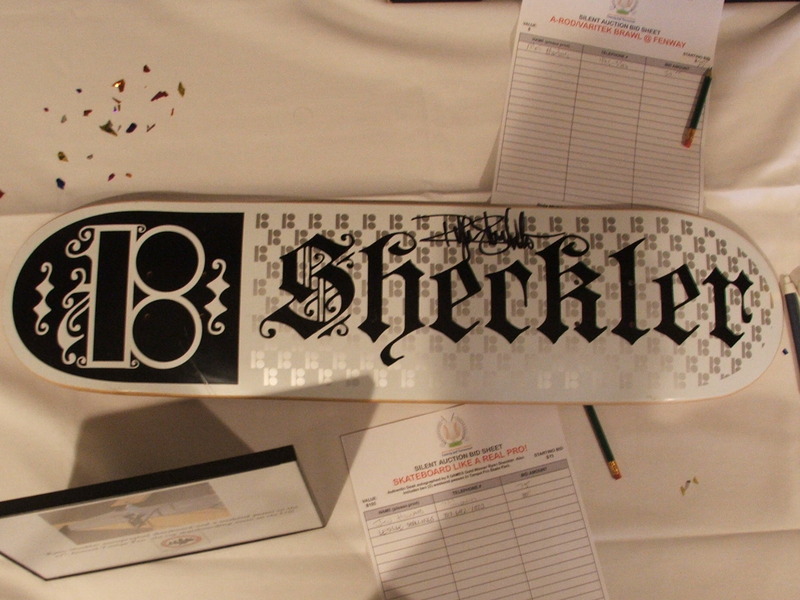 But the real winners here today were the two charities of both Litsch and Bechtel. There were whispers in the air that night of an even larger event in the future, and possibly two or more years at this same golf course. The Jays player community came out in force to support one of their own, and everyone involved vowed to be a part of the 2012 event. 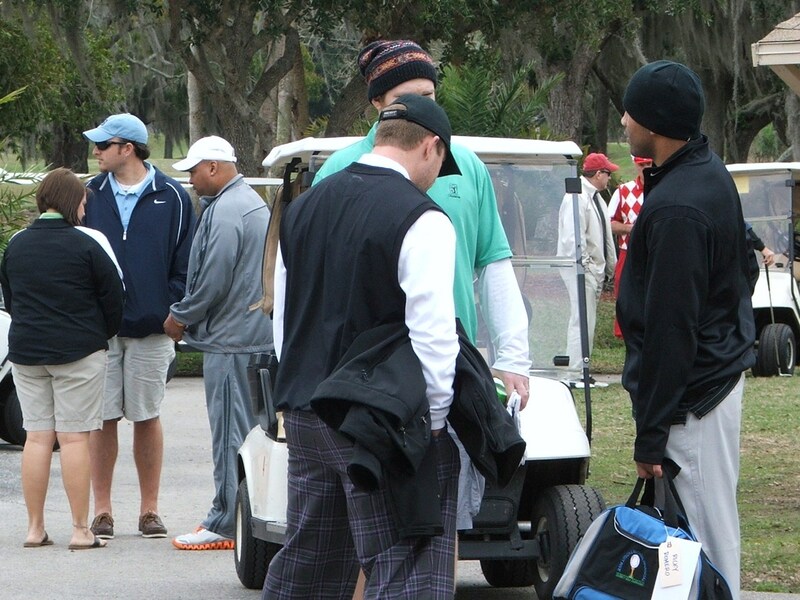 When a cause and a golfing event both run true to themselves, people want to be a part of it again and again. I hope to volunteer in 2012 for another go-round of fun in the Sun, competitive tomfoolery and to support two great and noble causes. 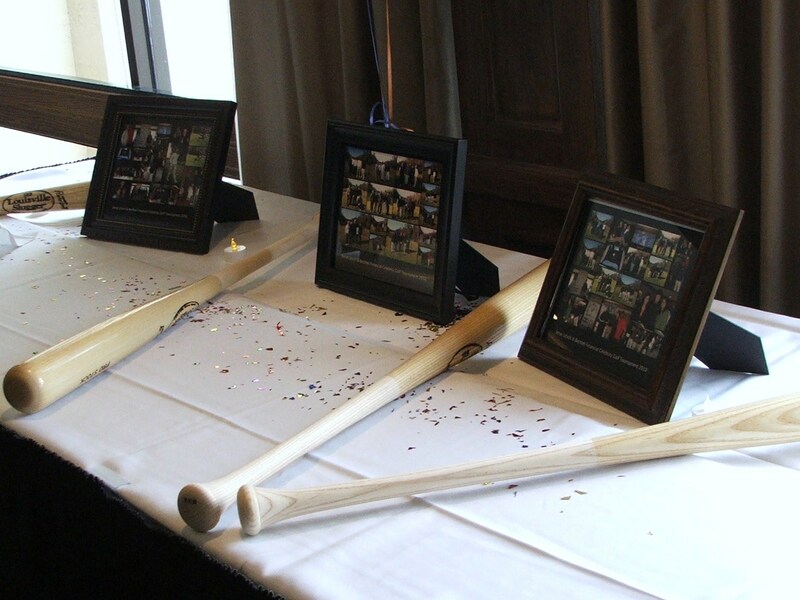 By the way, I did end up bidding on one of those 10 autographed bats… all for a pair of great causes. 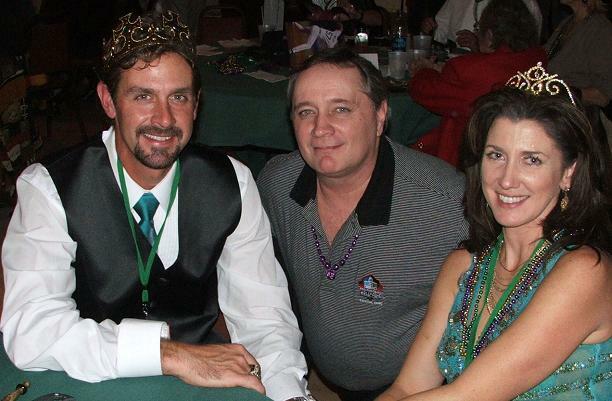 Miracle League, Mardi Gras Ball and King Rick! You have been hearing me mention the Miracle League for the past few days. Maybe on Day 6 of the charity week posts we should get to know this great organization. In 1997 in Conyers, Georgia, local baseball coach Eddie Bagwell invited the first child with a disability to play on his organized baseball squad. A young man named Michael, a 7-year old baseball enthusiast who practiced and attended every game in his wheelchair was the initial pioneer. At first Michael was there to cheer on his little brother, but the following year, in 1998, the Rockdale Youth Baseball Association (RYBA) decided it was time for a chance. They instituted the first league designed especially for children with disabilities and invited other special needs kids in their region to join their budding league. *** Every player bats once per inning. *** All players are safe on base. *** Every player scores a run before the inning is over (the last batter gets a Home Run). *** Community kids and volunteers serve as “buddies” to help assist the players during the games. *** Each player and each team wins every game. That has been the motto of the Miracle League ever since that first moment Bagwell invited young Michael to play with his team. From the first moments of the leagues existence to today, the main element of this league was for the players to realize they are not limited by their wheelchairs or disabilities but only by their own minds. Presently there are over 240 Miracle League organizations around the country, including Puerto Rico. At this moment in time, over 200,000 children and young adults playing in Miracle League around the country. Locally, the Kiwanis Club of the Gulf Beaches heeded the call to duty back in October 2004 after a speaker spoke and shoed the group a DVD about a new innovative youth sports program that had been showcased on the HBO Real Sports program. It was video about the Rockdale Youth Baseball Association and their journey to offering the first barrier free baseball field for kids with special needs. The presentation tugged at the hearts strings of everyone in attendance, and after the speaker finished, every member stood up and cheered, all agreeing that the Tampa Bay region needed their own Miracle League ballpark. 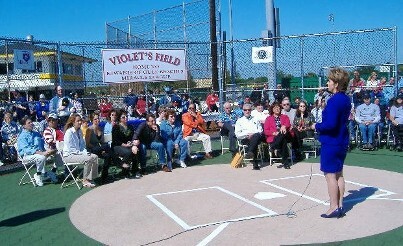 14 months later, “Violet’s Field” which is situated between the existing baseball field at the Azalea Youth complex held it initial opening ceremonies. Ongoing support is needed to keep up with the constant upkeep and maintenance of this complex, and the Kiwanis Club of the Gulf Beaches will conclude their third annual month of Mardi Gras celebration with a the organization’s second annual charity Mardi Gras Ball to be held at the historic Gulfport Casino on Monday, March 7, 2011 from 7-11 pm to benefit the Miracle League of the Gulf Beaches. The event will be presided over by King Rick Vaughn , who is also the Tampa Bay Rays VP of Communications and a great supporter of the Miracle League program. He will be joined in this event by his lovely Queen Sue. 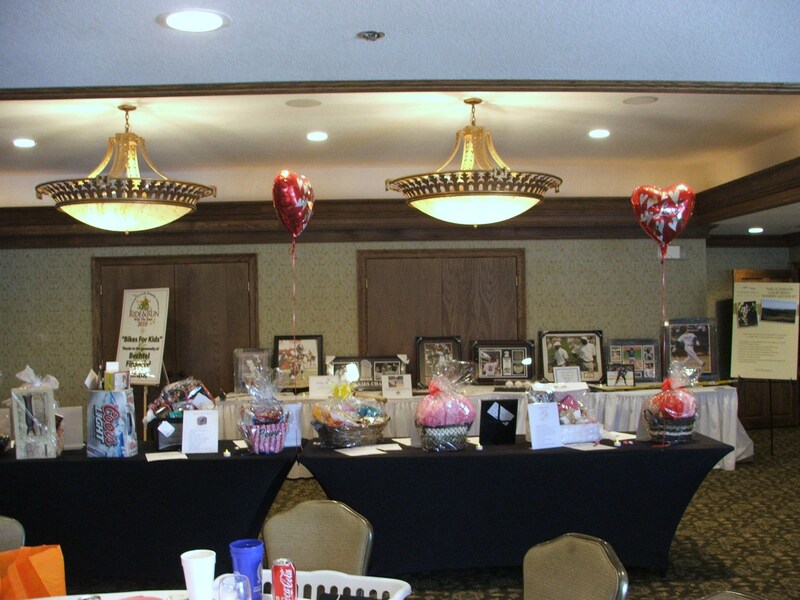 There will be an additional silent auction of items from around the community, including a few autographed pieces of baseball memorabilia along with several interesting door prizes to be distributed to those in attendance. The ballroom will be filled with the sounds of Cajun, Zydeco, Blues and Jazz music as guests bask in the quasi-New Orleans atmosphere complete with authentic Hurricane cocktails and authentic food provided by Bayou Catering. I actually was invited to the 2010 event by fellow Rays/Pepsi Fan Wall of Fame member George Stone, who is also the local Miracle League’s Director of Operations. Iwas promised a night of Cajun fun, food and excitement, and it delivered with gusto. I especially found the dance (Fais do-do) lessons extremely helpful since I am one of those people who love to learn something new every day. From the hour of group instruction to the amazing red beans and rice, Etouffee and decadent desserts, it was truly a great night to remember. I hope more of the faces I see among the stands in Tropicana Field will be able to attend this 2011 great event that helps support the Miracle Leagues of the Gulf Beaches. The cost is $ 25.00 and can be purchased in advance by calling Sue Reynolds at (727) 398-1360 in advance of the event. It is not mandatory that you dress in the garb of the Fleur-de-lis, but masks and flamboyant Mardi Gras themed apparel does help to heighten the mood. Until then, “Laissez le Bon temp rouler” (Let the Good Times Roll). Most fans around Major League Baseball who have heard the name “Eckstein” in the past automatically put the face of young Energizer bunny David Eckstein in minds. But there is another Eckstein brother who’s name currently has the MLB community buzzing about him. 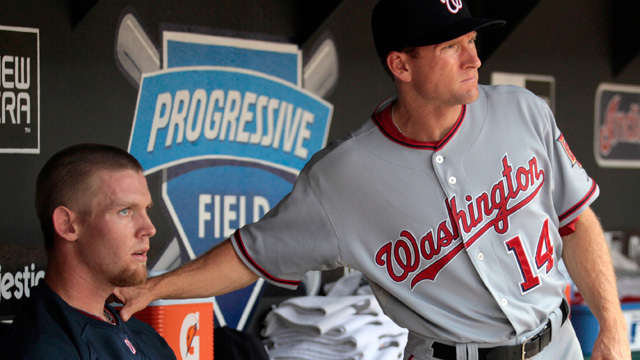 I decided on this Day Five of my “all charity week” to post a story about Rick Eckstein, who is the current Nationals hitting coach. 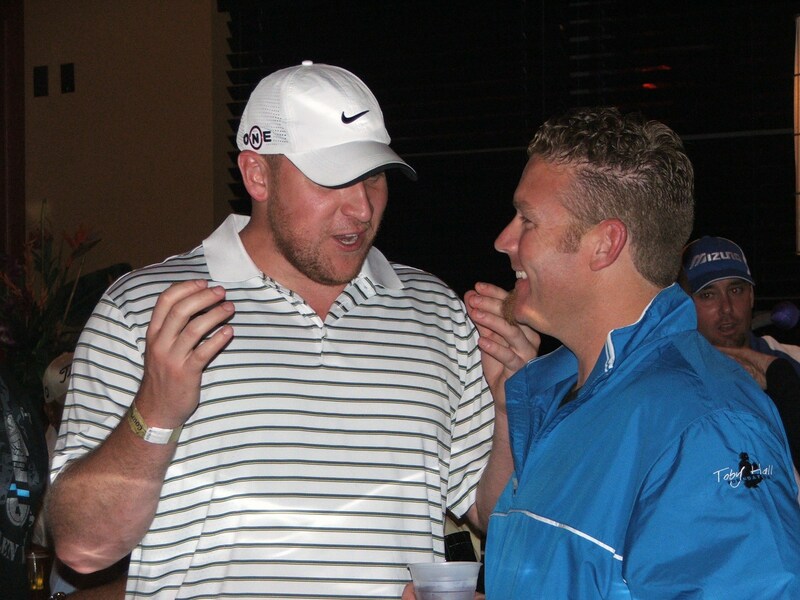 During the 2010 off season, Eckstein did something I find so unselfish and phenominal that it is almost beyond words. There is also a third brother in the Eckstein clan, older brother Ken, who was advised during the 2010 MLB season that he would need an additional kidney transplant. Both David and Rick instantly took the necessary tests to see if they were a compatible match for their older sibling, and Rick’s test came back as a perfect match. In a totally selfless act, Rick then decided to donate one of his own kidneys to help save his brother’s life. This would be Ken’s second kidney transplant after his initial transplant back in 1991 from an anonymous donor, Thatorgan was harvested from an elderly donor and his aged kidney suddenly began to deteriorate putting Ken on a dialysis machine. Late in the 2010 season Rick informed Washington General Manager Mike Rizzo and Nationals Manager Jim Riggelman of his transplant intentions, and was met with a hearty bond of encouragement and support from the Nationals organization. The initial prognosis has Rick possibly be back teaching hitting techniques within a weeks time baring any complications. 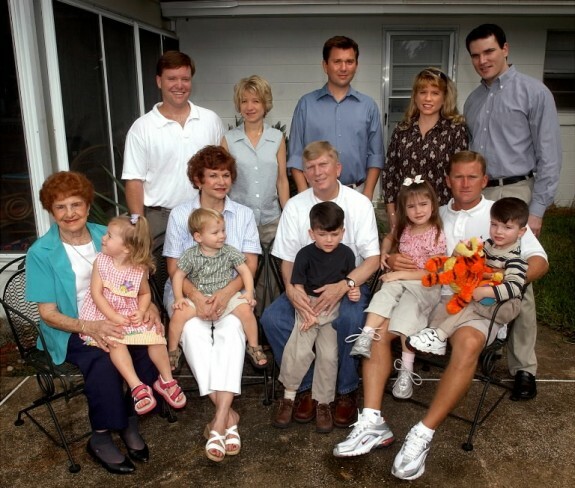 Kidney disease seems to run deep in the Eckstein families genetics as Father Whitey, plus sisters Christine and Susan also have had to endure kidney transplants in the past. All three are currently doing fine, with Christine hoping to be by her older brother Ken’s side as he goes through this second transplant. So far, Rick and his free agent younger brother David have not shown signs of kidney related problems. But it is an on-going process of testing and regulating their diet to try and keep the effects from providing the same results. Even before they proceeded with this second operation, both Rick and Kento make a public plea to make sure the public was aware of the importance of being a organ donor. This highly stressful event in the Eckstein family has emerged positive results, but some families do not have the resources or family compatible organ matches to facilitate a positive result. But giving unselfishly just seems to run in the Eckstein family. Their mother Patricia donated one of her own kidneys to her daughter Susan. And a family friend donated his kidney to Whitey. Christine got her transplanted kidney via the Florida organ donors program. This is a family that has been firmly touched by a health situation in such a way that words can not express the feeling or pain of the overall journey, but the outcome has been positive and provided a lengthening of life for both the family and their community. I want to commend Rick for his selfless act and one day I hope to shake his hand on an MLB sideline and tell him to his face what a heroci act that he performed for his brother. It is one thing to give of yourself donating your time and effort towards a cause, but to do something of this magnitude for a family member and also help raise awareness is inspiring and will have me check the box for organ donation on my Florida driver’s license when I renew this May. Second photo is obtained from the Orlando Sentinel. for some reason it would not let me pop the credit under the photo today. I do not know if any of you have ever meet an athlete who you just seem to click with on some level. Not talking about a stalking situation here, but one of those players you find yourself looking for on the field before or during the game hoping you get a moment, or possibly a head nod from them. Well, one of the players who always seemed to fit this bill for me is former Tampa Bay Rays leftie reliever Trever Miller. So as we embark on Day Four of the Rays Renegade charity challenge, I would like to introduce some of the great things Miller is still doing in the Tampa Bay area, even after his move to the St. Louis Cardinals. Most of the Rays Republic might remember that Miller has a special connection for wanting to give back to this same Tampa Bay community that stood by him and his wife Pari during their own time of need when the region offered tons of prayers, good thoughts and a people asking to this day “how his daughter Grace is doing?”. You have heard me talk about the Miracle League before in connection with the Toby Hall Celebrity Golf Classic. And you will hear that same organization’s name again on Thursday as I will be telling everyone about an upcoming event to be held in Gulfport, Florida that will also benefit this great organization. I attended this other event last season when Miller and his wife were the King and Queen of the Mardi Gras celebration and I had a tremendous time while also learning a few Cajun dance moves and sipping on a Hurricane (or two). 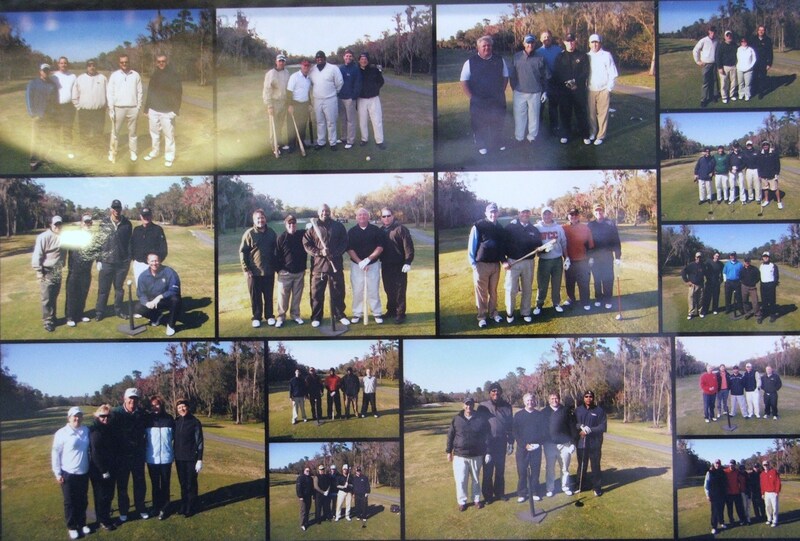 But on the Trever Miller’s Mob 2011 event, I am embarrassed to say I swung and missed on it badly. 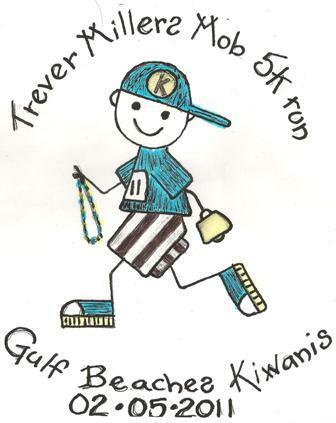 I somehow misplaced the flyer, and did not attend the 2011 Trever Miller’s Mob 5K Run held recently in Treasure Island, Florida. And it is my loss that I missed out on all the fun and adventure. Not that exercise is my enemy or anything (it’s not), but somehow I thought it was on another date. I some how did not input the information into my cell phone and missed a great opportunity to give something besides my time for charity ( a liter of sweat). How great is it that this event is for charity, but it seems that the runners/participants seem to get so much in return for their efforts, not only in physical exercise. There are the events special “Cowbell Awards” given out to participants, plus the first 200 entries got a “Certified Flat Fast Course Hi Tech T-shirt. How cool is that treasure trove of items given to the event’s participants. But it didn’t stop there. I also missed out on the fine food provided by Cody’s Roadhouse Grill, assorted beverages, great entertainment and raffles all because I might have needed a few more hours of beauty sleep ( it didn’t help). I also missed a fantastic tasty offer of a FREE appetizer to my favorite home cooking establishment, Le Roy Selmons. I am still Kicking myself extremely hard right now in the you know what. I even had friends from the ballpark participating in the event (Rose and Tommy). But what I really missed that day was seeing so many people assemble to help the worthy cause of the Miracle League of the Gulf Beaches. Miller has been a strong supporter of the league that gives special needs kids of all ages the chance to experience the game of baseball. More and more I am being pulled in by the excitement and atmosphere that surrounds the Miracle League, and I am actually look forward to going to their 2011 Opening Day ceremonies this Spring. I hear the event again went off without a hitch and everyone went home with a smile and maybe a sore calve muscle or two. But everyone who participated in the event that day to me are the true winners. I wish I had been there, even to cheer on the masses as they jogged, ran or even walked out of Rosselli Park on the Isle of Capri that Saturday. Heck, could of possibly spent a few moments running with Miller, chatting along the way about the upcoming Cardinals season, his Land-O-Lakes home, or possibly about how is daughter Grace is doing. I still ask about Grace and her life every time I see Miller, and his face lights up. Most people might not know I have a special needs sister who a tend to watch over and guide in her adult life now every day. She is doing great, and reminds me daily of the great gifts I have and pushes me to give more and more. Maybe that is the ultimate bond that seems to bind Miller and myself, or possibly it is that we have become baseball friends after all this time. I want to think it is a healthy combination of all of the above. Day three of the all charity week will feature a man who right now is on top of his game. 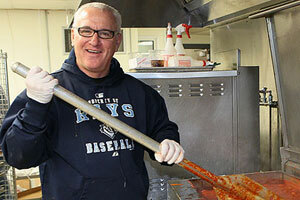 There is no doubt that the Third Base Luncheonette in his hometown of Hazelton, Pa will have to provide a “Joe Maddon Special” today, possibly consisting of a large plate full of pierogies and pasta made with the motherly love of Ms Beane. 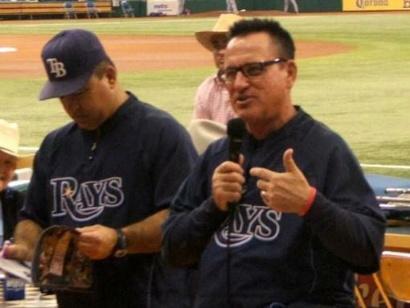 The object of today’s charity post is of course Tampa Bay Rays Manager Joe Maddon, but not only because it is his birthday, but because he is going to let a choice roomful of Tampa Bay Rays fans also celebrate “Thanks-Mas” during the Rays upcoming Fan Fest (2/19). The holiday tradition will spill allover the Batter’s Eye Restaurant located just above Centerfield as Maddon and the Rays Foundation bring a Spring-time rendition of one of Maddon’s finest charity works. From 1:30 pm until possibly 3:30 pm that day, Maddon and his Rays helpers will deliver plentiful plates full of his trademark holiday fare including homemade spaghetti and meatballs, Italian sausage, pierogies, mixed greens salads assorted desserts and complimentary beverages. Recipients of this VIP events will also have a chance to ask Maddon some questions during a 1-hour Q and A session, plus all proceeds will benefit the Rays Baseball Foundation and the Salvation Army. There in timely catch to this event. There will be limited seating, so it is important that you reserve your place at the table today. Pricing for a chance to dine on the same hometown delicacies that Maddon made during his annual Thanks-Mas pilgrimage this Winter. Pricing for the event will start at $ 30 for adults and $ 10 for children under 14. If, by any chance there are still tickets available during Fan Fest, those prices will rise to $ 40 for adults and $ 15 for children. Fans attending the event will also have a chance at great treausre chest of prizes like a catered Luxury Suite experience during a 2011 Rays game as well as some signed items from Maddon. The Rays have asked that no one pursue autographs from Maddon since he will be signing below in the autograph tables after the event. This is another great example of one of the Rays high profile personalities giving back to his adopted community, this time in the Spring. . It is a great chance to witness, eat and hear the inspirational leader of your Rays talk about the upcoming 2011Spring Training and regular season. His love for biking and old muscle cars, or possibly give you an inside glimpse at his mantra for 2011. 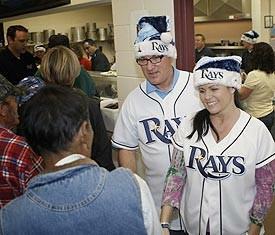 I have heard Maddon speak to the Maddon’s Maniacs booster club several times over his Rays years,. Just hearing Maddon talk about the game of baseball, plus the extra bonus of possibly having Maddon answer your question is way beyond the price of admission. I also have it on great authority (from within the Rays inner sanctum/clubhouse), the man can also produce a pretty awesome meatball and silky smooth pierogie. Oh! by the way Joe…….Happy 50-ish* Birthday! Day 2 of the Charity Week experience. This charity event actually took place last Thursday, but somehow I lost my little camera video card in the movement from the camera to the computer. 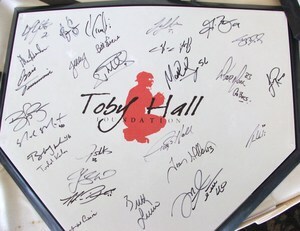 Now that the day’s photos are safely within the computer, it is time to give you some of the highlights and tales from the 2011 Toby Hall Celebrity Golf Classic. 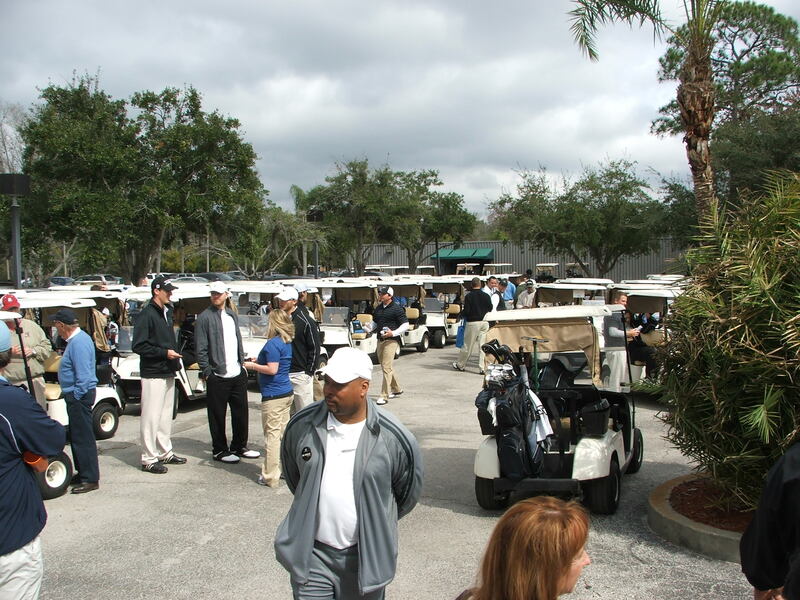 This is my second year volunteering for this golfing event that first started out as a bowling event in Tampa so many years ago. 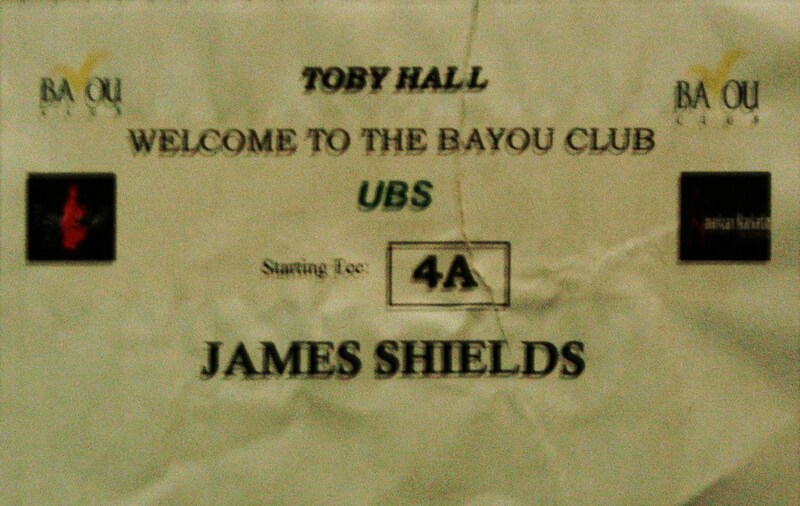 Arrived at the Bayou Club gold clubhouse about 9:45-ish and immediately came face-to face with three off-duty members of the St. Petersburg Police Department. They were there as special guests of Hall to participate in a fundraising event through their memorial T-shirt benefiting the families of two recently slain SPPD officers. 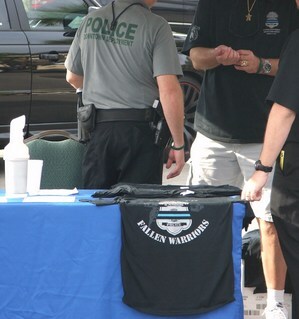 During the charity event, the SPPD representatives set up a tent at the turning point or Hole 9.5 of the course and as the golfing pairs came up to do the putting challenge, they could also purchase T-shirts and speak to the officers( including a K-9 officer) that knew the two officers. 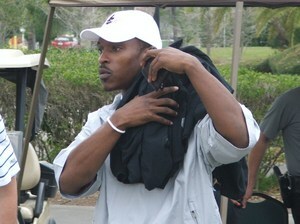 When Tampa Bay Rays centerfielder B J Upton’s 5-member pairing came up for the putting contest, Upton took a moment to go over to the SPPD tent and purchased not one, but over a dozen T-shirts, including one for everyone in his pairing group. Fellow Rays Fans Wall of Fame member George Stone was on the scene again that day spreading the word about the featured charity of the event, The Miracle League. Some might not know that the Miracle League is a baseball league formed so that children of all ages with special needs and abilities can also enjoy the greatest game on dirt. At one point later in the evening, Stone actually got a verbal commitment from St. Petersburg Mayor Bill Foster to attend the 2011 Opening Day event in St. Petersburg. 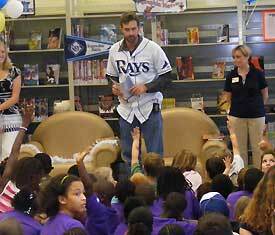 There were plenty of Rays, plus ex-Rays on hand this day helping Hall in his quest to help this great organization. 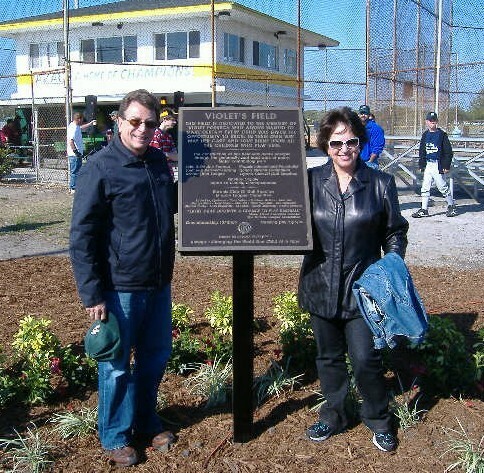 I remember a few years ago when they completely re-constructed the Miracle League field in the Azalea region of St. Petersburg, just down the street from the old Rays Spring Training facility. 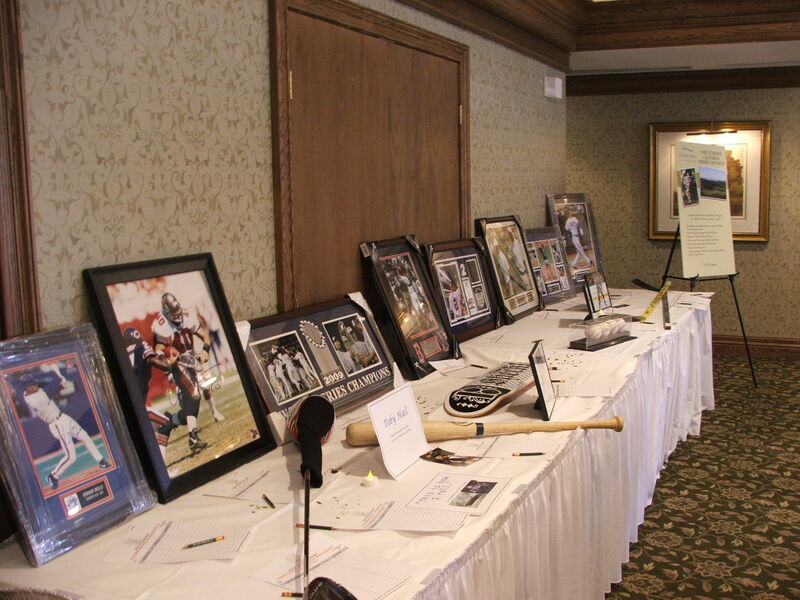 On hand that day supporting Hall’s charity event was Dan Wheeler (Red Sox), Jesse Litsch (Jays), Brian Stokes (Jays).Boof Bonser ( NY Mets), Jason Michaels (Astros), Trever Miller (Cardinals),Ryan Webb (Marlins), Gregg Zaun (Padres), Miguel Cairo (Reds). Bobby Wilson (Angels) and Jorge Cantu (Padres), plus former NBA star Matt Gieger and retired Bucs running back Mike Alstott. Representing the Rays was Upton, starter James Shields, RP Andy Sonnanstine, and new RP Adam Russell. Also on hand were a few other well known Rays faces either from the Coaching ranks, or from their on-the-field reporting. Broadcaster Todd Kalas was joined on this day by current Rays Third Base Coach Tom Foley and former Rays Coaches Bill Evers ( Durham Bulls), Ozzie Timmons (Columbus Catfish) and former Hitting Coach Steve Henderson. Rays shortstop Reid Brignac was also scheduled to attend, but had an emergency. I was stationed to begin the day in the registration area handing out specially made Toby Hall caps, visors and rain slickers. 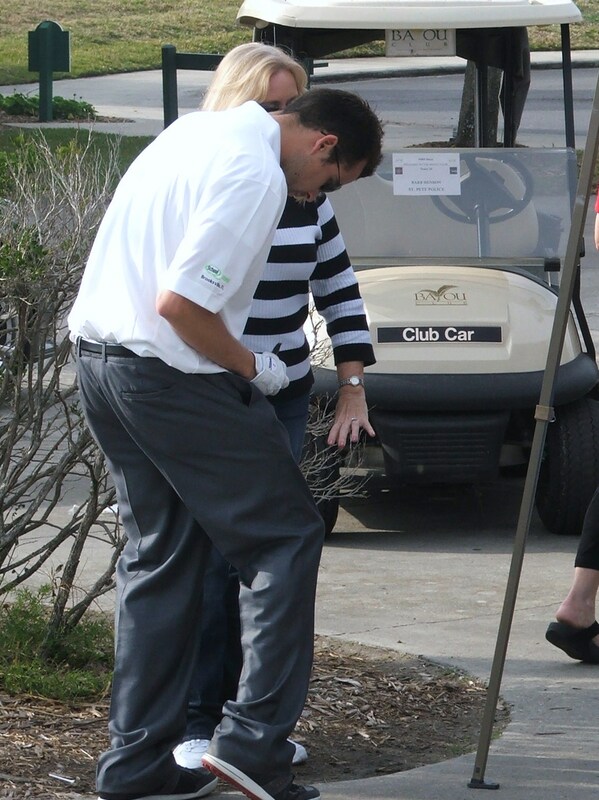 But just as it seemed I might have an early end to my day, I volunteered to run the putting contest. It was a great time in which each pairing member got a chance to hit one golf ball into a sectioned off squared area for multiples of points with a maximum of 10 points if you sunk your putt..
You could cut the air with a knife as to the early competitive nature of the event as Cairo was the closest to the hole for most of the day until 5 pairings from the end, the cream began to rise to the putting top of the pot. 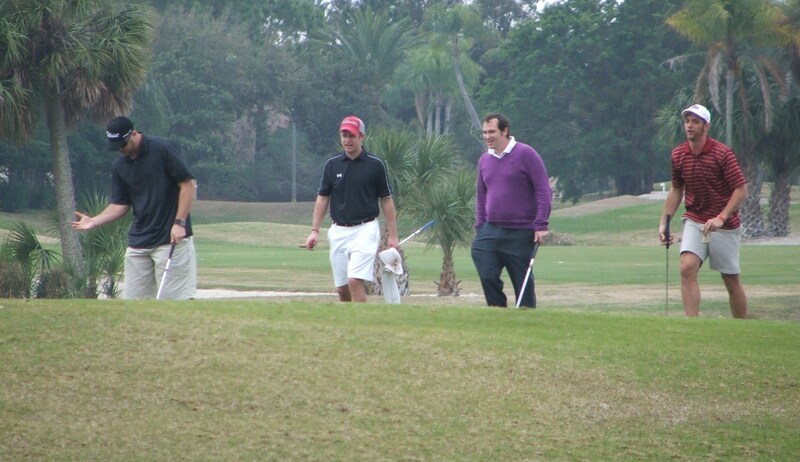 Local attorney David Papa, who was in the Wilson pairing found the center of the hole to become the first to thrust his team to a sizeable lead. ( total 14 points). 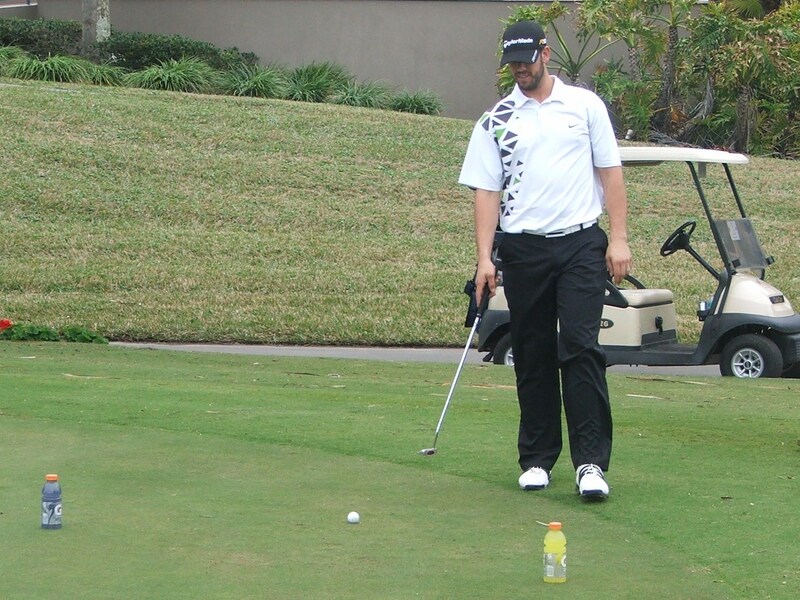 That total seemed safe until one of the last groups, which included LPGA star Brittney Linicome, had their first putting contestant Tim Nalls of American Marketing put in square in the hole. With an immediate 10 points, this team was quickly putting (bad pun) itself into contention for the Putting contest crown. But suddenly we all noticed that Linicome, who had an early flight out of Orlando in the morning for a LPGA event had left before taking her putting chance. 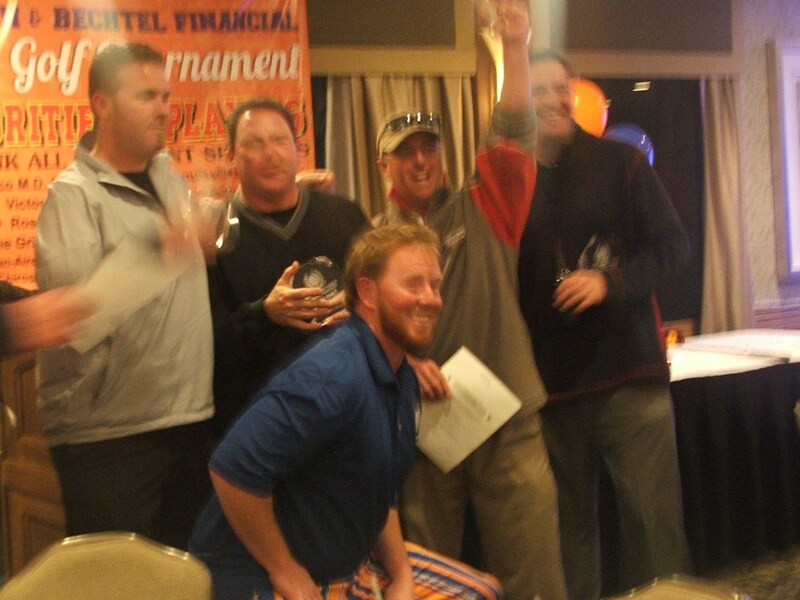 I made an executive putting contest decision to let Nalls put his way to either team victory, or a second place finish. The climatic moment was short lived as Nalls pulled his second try to the right and did not even register a single additional point. 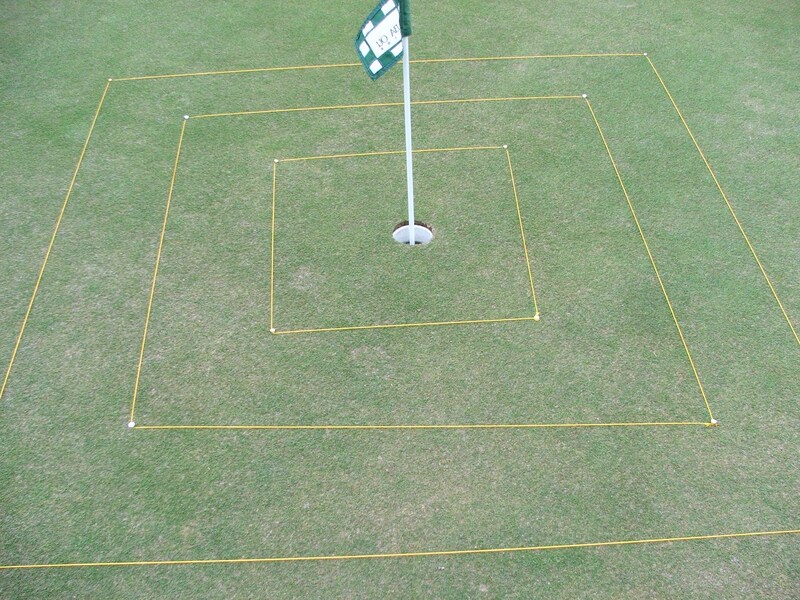 I wonder if Linicome would have gotten them that needed 5 points for their victory by putting her golf ball in the inner square within a foot of the hole? We will never know. 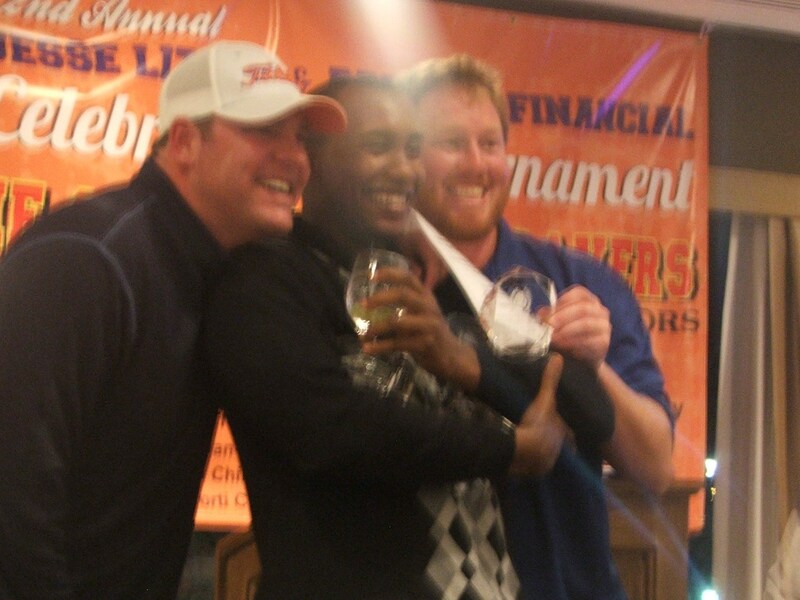 But the solace of placing second was definitely short lived by the Linicome pairing as they finished the event with a 52, good enough for the eventual top finish in the tournament and bragging right for the entire year. As the teammates from the Linicome pairing basked in the afterglow and celebrated at the after party at Courtside Grille minus Brittney. The real winner here was the Miracle League. I have been proud the last two years of volunteering in this event, and also made a commitment that day to help another event that will be held this Friday. 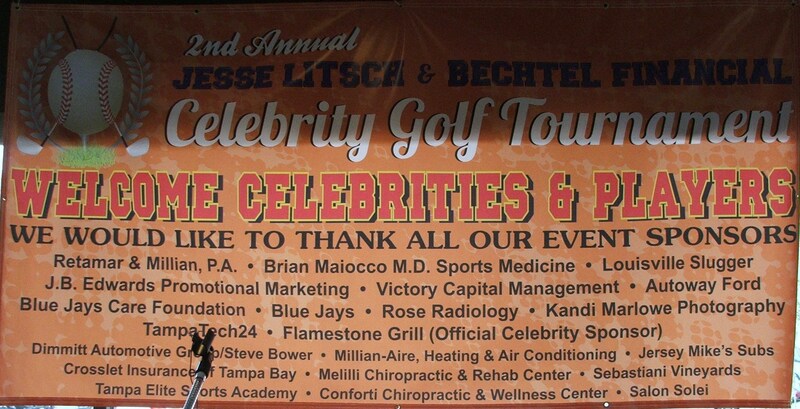 On that day I will be helping out the Jesse Litsch & Bechtel Financial Celebrity Golf Tournament in Oldsmar, Florida. How can I possibly complain, another great day in the Sun with athletes supporting their local charities and spreading the news of this great charitable golfing event. I want to remind the Rays Republic that the memorial T-shirts that benefit the families of the two slain SPPD officers will be ongoing in the Tampa Bay community. You can contact, or visit the St. Petersburg Police Department’s lobby to purchase a T-shirt, or contact them about ongoing outside T-shirt opportunities within the community. Please support this worthy charity and remembrance of these Tampa Bay heroes. Again I want to thank Tracey and her staff plus Toby for the adventures and memories. Believe me, I have more than a few moments to tell people about that would not fit on this post today. 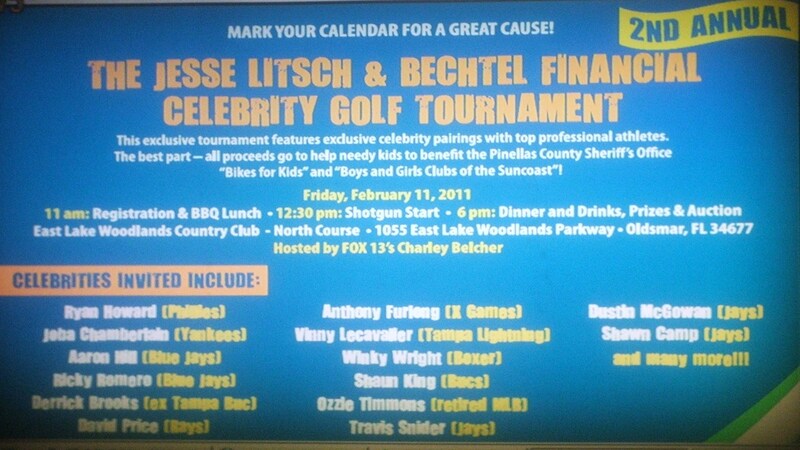 But that is the great thing about charity events like this that happen so close to Spring Training. The excitement levels in seeing past friends and the approaching report dates just adds to the zeal and essence of the tournament. I am already looking forward to the 2012 event. I want to post a link here for the Miracle League of the Gulf Beaches and hope that all of us can contribute in some way to a great organization that brings the love of the game to some that might not be able to run, hit or even pitch like everyone, but the smile and joy on their faces as they move around the bases makes it so worthwhile.